Would a leak detection professional really need to dig holes? When you first find a leak on your property you’re probably going to panic at first – not knowing what to do next. 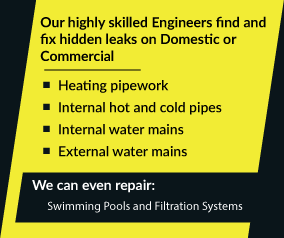 The best thing to do is not struggle with the problem yourself – just call in ADI to find the source of your leak. We use the very latest in leak detection technology so we can find any interior or exterior leak with a minimum of disruption to you or your family. The level of efficiency our equipment allows us to achieve means that we can offer our customers very competitive pricing as a result. Our services are also available to customers living anywhere in the United Kingdom of course. Why don’t you give us a call now on 08007313843 – any one of our team will be only too glad to help you.